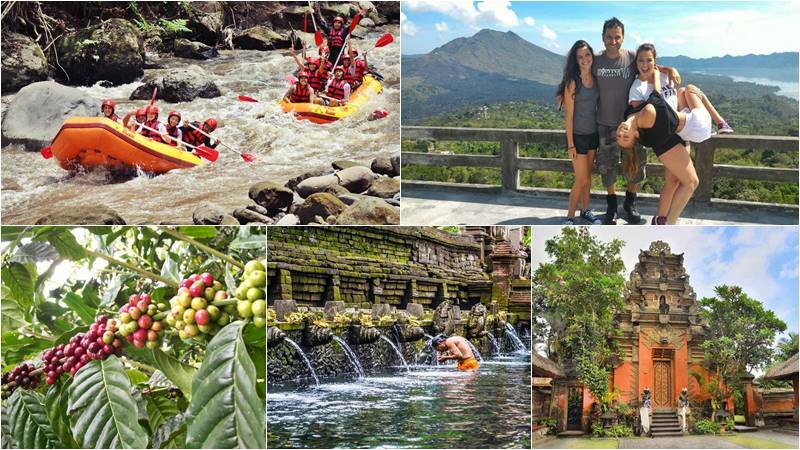 Bali Rafting + Volcano + Ubud Tour is an interesting Bali Rafting Tour Package, which combines Bali whitewater rafting on Ayung River with exciting adventure trip and a wonderful view over Kintamani Batur Volcano, which overlooks its quiet crater lake., then stop at spices garden, rice terraces and visit Ubud arts and Ubud center as the home of fines Bali arts gallery. 14.15 – Visit Spices garden. 15.15 – Visit Sebatu Holly spring Temple. 16.00 – Visit Tegalalang Rice terraces. 16.30 – Visit Ubud Palace and Ubud Center with Ubud arts market. Join our professional team on the Ayung River for fantastic water rafting adventures, enjoy a unique and unforgettable tour through winding gorges, the sumptuous jungle and the splendid terraced rice field. The water volume is stable throughout the year with few speeds of water, allowing you to have great fun with calmness. All participants will be fitted with helmets and life jackets from our beginning at the start point. Our experienced guides will lead you through your thrilling Ayung rafting adventure for around 2 hours. Follow his instructions and paddle along the way, laughing, shouting and having an unbelievable adventure. This is the best way to experience the amazingness of the Ayung River. Witness the magnificent views of the Volcano Batur, overlooks its tranquil crater lake, cooling and breezing temperatures, spend your time to take some photos. The visitors may get smoke from the lowest crater on the last small eruption of 1963 and 1990. Take your time and taste your local coffee, ginger, tea and other local produce in a peacefully garden with local spices such as coffee, vanilla and cloves, and see how they produce coffee traditionally. The famous Bali gold coffee is animal Luwak Coffee which is come from the animal feces and very good for the health. Take a photograph of the Sebatu Holly Spring Temple, feed the holly fish and wash your face in order to enjoy eternal youth. According to the local myth, the spring is created by the God of Indra who fought against the Evil King Mayadenawa. Picturesque rice terraces in the northern part of Ubud, very popular with visitors. There is now a restaurant or coffee-bar along this site, and rice terraces are great to enjoy while having tea or coffee. Some locals try their luck with their native English to sell the souvenir to the visitors. The Ubud Royal Palace is a Ubud Kingdom Palace, and has a beautiful traditional Balinese house as Ubud King’s residence. It is located in the center of Ubud Bali and faces the traditional art market. It was found in the year 1800 – 1823 by Ida Tjakorda Putu Kandel. The palace is a center of artistic cultural life, whilst the traditional market symbolizes the local economy. Puri Saren is equipped as a palace with a Wantilan / auditorium, which is a large building of a meeting room and a banyan tree as shelter place at the daytime. Ubud village has been a “royal town” for over a hundred years. Just in front of The Palace is Ubud Arts Market for visiting. Optional stop If you are interested in seeing the local craftsmen in various villages along the way back to the hotel.